I love doing cross-overs and it seemed to me that Daria and Jane had some similarities with Enid and Rebecca. Their stories are both about the friendship of two young woman, trying to cope with their environment. Only by then end of their stories, Daria and Jane are still friends whereas Enid and Rebecca aren't. I wanted to draw in the style of each, but there had to be a certain consistency so I used three sets of photos as sources to create this work.The background is from the Ghost World film and can be found at Ghost World/Real World. Enid and Rebecca are also from the film and found at Daniel Clowes Wants to Revisit His 'Ghost World' Characters, Talks 'Wilson' Film. 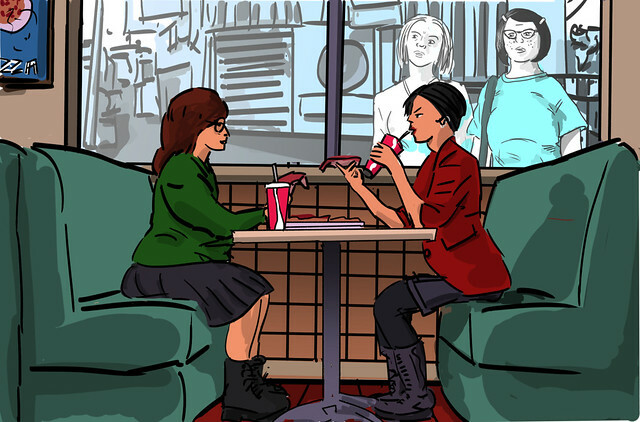 Finally, I searched for screenshots from the Daria show for Daria and Jane eating pizza. I found a number that made good colour references, but in the end I used a photo from Perhaps the best Daria cosplay as the source. Because the sources were all from "real life", the proportions should match (I hope). I plan on doing a sequel, where Trent has his friends Shaggy and Jughead over for pizza at the house, while they try some herbal cigarettes. We'll see. Yesterday's future often becomes tomorrow's junk.